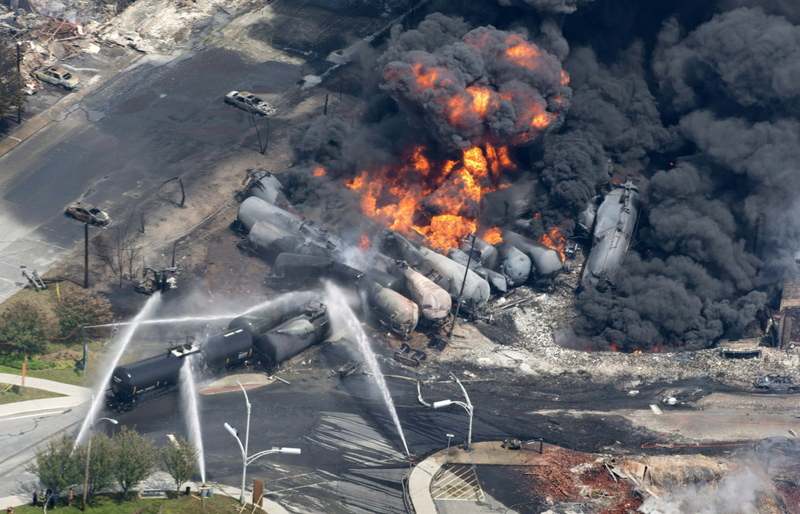 Before making plans, the rail company blamed in the Lac-Megantic tragedy should get government officials’ go-ahead. It’s been less than a year since a runaway oil train derailed in Lac-Megantic, Quebec, causing a fire that killed 47 people, but that hasn’t stopped the new owner of the same railroad from announcing plans to resume oil shipments to New Brunswick – after passing through Lac-Megantic and Maine – as soon as next year. Central Maine and Quebec Railway undoubtedly wants to reassure shareholders, but its CEO, John Giles, is speaking prematurely. The 2013 tragedy in Quebec has raised significant issues that should be resolved before the railroad creates a timetable for reviving the oil transport link. Last Friday, when Giles announced plans to restart oil shipments through Lac-Megantic, he was quick to add that he intends to carry out safety measures. Namely, $10 million in repairs to sections of the track so that train speeds can be safely increased to 25 mph. That’s a step in the right direction. But the CEO didn’t address the contradiction between his company’s plans and calls in Lac-Megantic for the tracks to be rerouted so they don’t pass through the center of town – a project that could cost anywhere from $50 million to $80 million. Lac-Megantic’s mayor has raised another valid concern: whether railway operators have enough insurance to cover the costs of future disasters. The now-bankrupt company involved in the Quebec derailment had only $25 million in insurance; the price tag for the cleanup of last summer’s tragedy is expected to reach $200 million. The Canadian government has said it wants rail companies to carry more insurance, but it hasn’t yet decided how much more. Also pending is a final investigation report from the Transportation Safety Board of Canada. The watchdog agency has already issued interim rail safety recommendations and is expected to provide further guidelines. Any plans by Central Maine and Quebec Railway to resume oil shipments should be on hold until new government regulations are spelled out and it’s clear that the company is adhering to them. In February, John Giles told the Bangor Daily News that Central Maine and Quebec officials “haven’t satisfied ourselves that we are capable of carrying crude safely and efficiently. That would and should be a pre-condition to doing so.” In the three months since Giles made that statement, there’s insufficient evidence that the railroad is prepared to operate at a level that will prevent further harm to those in its path.